In little more than the space of a calendar day, the Yankees went from being triumphant series winners to being down 0-1 in the ALCS. They also went from following Mr Postseason to being a bunch of leaderless parts that don't seem to fit together. * Mariano Rivera was lost for the season with a knee injury. *Brett Gardner was out for most of the regular season with an elbow injury. * CC Sabathia had two stints on the disabled list, for groin and elbow problems respectively. 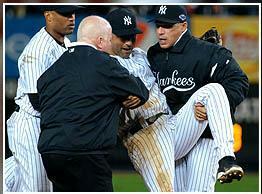 * Andy Pettitte was out almost two months with a broken bone in his leg. * Alex Rodriguez was out for more than a month with a broken hand. * Mark Teixeira was out for about a month with a calf injury. If all of these things happened and the Yankees still made it to the ALCS, surely Derek Jeter's injury does not mean they are finished. Unless, as I said, they continue not to hit. What will it take for the offense to wake up? I agree with those who say that Nick Swisher should be benched and Brett Gardner should start. But that move alone doesn't help. The rest of the bats need to wake up in order for this team to have any chance at winning. The Tigers are sending Justin Verlander to the mound in Game 3, which means that today's Game 2 is a must-win for the Yankees. The pressure is on. Note: This odd postseason schedule prevented me from previewing this series before it started. I had wanted to put together a podcast like the one I did before the ALDS started but, there was no time. If there was time I would have included in it a prediction that the Yankees would win the ALCS in 6 games. But with last night's developments I have no idea. We just have to wait and see what happens.